As legend has it, these were the utterances between Juan Trippe of Pan American and Bill Allen of Boeing while fishing from the Wild Goose in Puget Sound one summer’s day. By the end of their outing, there was, according to Bob Gandt in Skygods – The Fall of Pan Am, a verbal commitment to build an aircraft what in Trippe’s mind would be a “stopgap airplane” top fill the void between the first generation jets – the Boeing 707 and the DC-8 – and the yet-to-be-built Supersonic Transport, the SST. 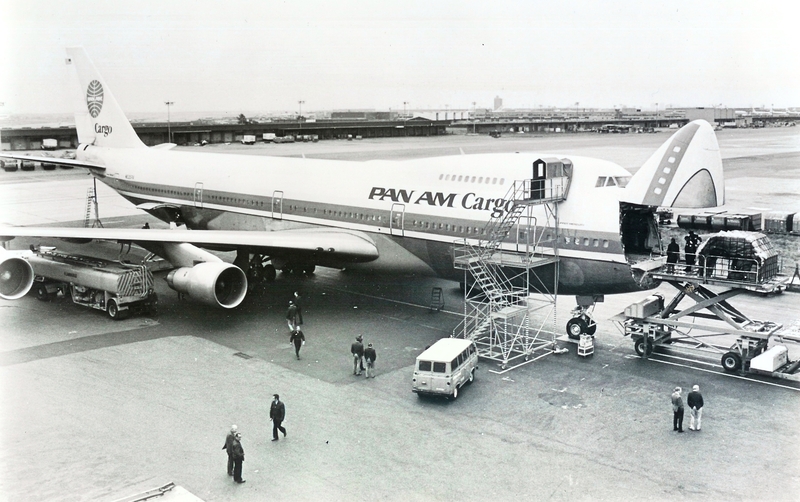 Pan American had been enjoying unprecedented growth during the decade of the 1960s, with traffic, according to R.E.G. Davies in Pan Am – An Airline and Its Aircraft, increasing an average of about 15% per year. Business was booming and it was time to move forward. What was the next step? In Robert Daley’s An American Saga, the next step could have been the Supersonic Transport. At the time, the British and French were planning the Concorde. In the US, there were also plans for an SST, but the costs were beyond what the government could afford. Because of that, President Kennedy was put into a position as to whether to back the US project or not, and before he could decide, asked the then head of the Federal Aviation Administration, Najeeb Halaby (who would later become Pan Am’s Chairman) to ask Juan Trippe not to buy the foreign Concorde. Trippe, however, was aware that Kennedy was wavering and decided to force the President’s hand. He traveled to England and France in May 1963 and , according to Marylin Bender and Selig Altschul in The Chosen Instrument, “took an option on eight planes. . . [and] became the first airline other than Air France and B.O.A.C. to order a supersonic airliner”. This did not go over well with the President. Unfortunately, the SST would not become operational for another ten years, and something needed to be done with the anticipated increase in airline travel. What would that be? According to Ron Davies, “Trippe had always been bolder than his contemporaries in going for larger aircraft; indeed he seemed to have followed a policy of ordering types which were typically twice the size of the previous generation. * * * [and] [t]he only way to increase capacity, apart from adding frequencies – another method of coping with increased demand, but which was practically impossible, because of airport and airway congestion – was to increase the aircraft size.” And that resulted in what Bob Gandt referred to as the “Everyman Airplane”: “The first jets had made world travel available to Everyman, not just the rich and elite. Now they had to build an airplane to satisfy the new yearning to travel – an Everyman airplane.” Thus lay the seeds for the Boeing 747. On 22 December 1965, Juan Trippe and Bill Allen signed a Letter of Intent for the Boeing 747. On 13 April 1966, Pan American formally ordered twenty-five airplanes. But before the April agreement, a huge obstacle arose: On 30 March, President Johnson invited the Business Council to a dinner. Both Juan Trippe and Bill Allen were in attendance. During the dinner Johnson pleaded for austerity due to economic problems caused by the war in Southeast Asia. This jolted both Trippe and Allen, whose 747 project was not exactly austere. Was the project in jeopardy? After the dinner, Trippe, who had previously no success in having a personal meeting with Johnson, approached him to press his case. Johnson asked Trippe if anyone knew about the project and Trippe said “no, except for Bill Allen”. Johnson then asked Trippe to be at the White House the next day “to see someone”. The next day Trippe was taken to the Pentagon to discuss the project with the Secretary of Defense Robert McNamara. At the time, another large capacity aircraft, known as the C-5A, was being developed for the Pentagon by Lockheed. McNamara pressed Trippe on the possibility of his waiting for a commercial version of the C-5A. Trippe argued his case for the 747 noting the impracticability of creating a commercial version of the C-5A. McNamara agreed and brought Trippe back to the White House where Johnson ordered that they “work it out”. Both Trippe and Allen hammered it out with the White House and the Pentagon, and then went for approval from their respective Boards of Directors. With Johnson’s approval, the Pan Am directors were convinced. So convinced, that an option for an additional ten planes was authorized for incorporation into the contract, thus making it, according to Bender and Altschul, “the largest single order for a single aircraft model in the history of commercial aviation”. “Pan Am’s Juan Trippe was a visionary executive who dreamed in only one dimension: big. Pan Am was the launch customer for the first successful jet transport, the Boeing 707, and it was Trippe who saw the need for an even larger airplane to keep up with the burgeoning growth in air traffic in the early ’70s. In the mid-60’s, when the 707 was still a novelty in the world’s skies, Trippe took his ideas to Boeing’s Bill Allen. He and Allen were alumni of the old school, both of them men of courage and daring, and after many long and sometimes contentious meetings between Pan Am’s planners and Boeing’s engineers, the decision was made to go ahead with the giant aircraft. “It was a tremendous gamble. The 747 would embrace new design and technology that up to then had only existed in the dreams of engineers. The technical hurdles that had to be cleared were enormous. The new airplane would carry up to 500 passengers; one of the early questions was, how do you evacuate 500 people from an airplane in just 90 seconds? The FAA, approached by Boeing to relax its 90-second evacuation criteria, dug in its heels and remained firm. 90 seconds was the limit, or the airplane would not be certified. Engineers wrestled for days with the problem, and eventually redesigned the interior of the cabin to include not just one center aisle, but two, running the entire length of the airplane, with cross-aisles at each of the four main entry doors (there was an additional over-wing escape exit). The doors were redesigned to permit egress of a staggered two-abreast. “Perhaps the biggest obstacle to the aircraft’s designers was that of the engines. While Pratt & Whitney was working on the prototype of the huge JT-9D engine, it had yet to be tested, and it was far from certain that it would be ready in time to mate with the 747. Boeing had bitter memories of the B-29 bomber and its star-crossed marriage with the Wright Cyclone engines, which had a nasty habit of catching fire and burning off the wing. The giant JT-9D engine would be the first jet engine mated to an airframe that had not earned its stripes on the wing of a military airplane. It was an enormous gamble. “The initial design specifications of the new airplane had the takeoff gross weight pegged at 550,000 pounds. As the 747 design grew and matured, it put on weight, the bane of every aeronautical engineer. A massive effort was directed at slimming-down the airplane, and eventually an all-up weight of 710,000 pounds became the final design target. Four engines, each producing 41,000 pounds of thrust, would be required to get the 747 airborne, and as the airframe design came closer to being finalized, Pratt was way behind the power curve. Engine development and production proceeded so slowly that the entire project threatened to sink under its own weight. At one point there were so many engine-less airframes sitting on the ramp at the Everett production facility that their cost exceeded the net worth of the Boeing company. “The early JT-9D-3 engines that powered the early model 747s were fraught with problems; they suffered from frequent compressor stalls, and would overtemp at the drop of a hat. It quickly became a procedure that once the engines were running, while the airplane was on the ground at least one of the three cockpit crewmembers had to constantly monitor the engine temperatures for overheat. Even the first scheduled passenger flight of the giant airplane was delayed several hours because of engine problems, severe enough to force an ignominious change to a backup aircraft. The sheer weight of the engine and nacelle resulted in a new, heretofore unknown phenomenon, the “ovalizing” of the engine itself. Its weight was literally pulling the engine out of round. One of Boeing’s engineers put the situation into cleverly-phrased perspective. “We have an unround situation,” he said. “Trippe envisioned the 747 as a bridge aircraft which would carry the airlines through the adolescent years of the jet age until the supersonic transports, or SSTs, came along. He insisted on the double deck design for the jumbo, with the flight deck perched high above the main level, so that when the airplane had outlived its passenger-carrying days, it could readily be converted into a very economic cargo carrier. The nose cone would swing upward to reveal a nearly 200-foot straight-in main deck, accommodating cargo of a size and weight that would have been unthinkable just a few years earlier. “Here the visionary pioneer made a major miscalculation. The SST would be personified only by the Anglo-French Concorde, and even then only a few would be built. Esthetic and graceful, it was nearly an economic disaster. Designed when jet fuel was literally pennies per gallon, by the time it had completed what was then the most exhaustive test program ever devised, the oil crisis of the early ’70s had made the airplane almost prohibitively expensive to operate. It soon became obvious that there would not be squadrons of supersonic transports gracing the skies, criss-crossing the oceans and continents to the world’s capitals, slicing flying times from hours and hours to hours and minutes. The United State’s answer to the Angle-French Concorde, Boeing’s 2707, was slain by the stroke of a Congressional pen. The B-747 would have to carry the transoceanic burden, at least for the foreseeable future. “The introduction of the Boeing 747 represented a quantum leap in air transport technology and design. Twice as big as its predecessor the 707, the Jumbo not only dwarfed anything it might encounter on the world’s airport ramps, but provided wonderful grist for anecdotal tales that were told among the airlines that were fortunate to have been at the head of the line to fly her. Untold numbers of photos were snapped of comely stewardesses (still so-called in the early ’70s) standing in the cowling of the huge Pratt JT-9 engines, surrounded by the great shroud that enclosed the big fans. “Artist’s renderings” was a fanciful term applied to the surrealistic drawings of the new 747 that appeared in promotional material. The airplane was parked at a futuristic terminal, with a jetway conveniently nestled against each of her eight main entry doors. There were piano bars (an innovation that briefly came to pass with at least one jumbo operator) and movie amphitheaters, a Radio City in the sky. Passengers would be able to pass to and fro, as though attending a wonderful, celestial cocktail party. Pan American’s 1967 Annual Report noted that its order for the Boeing 747 “led the airline industry to a new generation of heavy duty transports. . .[and that] new standards of passenger comfort and convenience will be introduced. Simplified ticketing, computerized check-in and automated baggage handling will be provided. Pan Am’s 747s will have two aisles and seat 366 passengers.” In the 1968 Annual Report, Pan American noted that the “year 1969 will mark the beginning of the second stage of the jet age – the time of the Boeing 747 and other wide-bodied, advance-technology jet transports. Pan Am again is the leader. * * * Pan Am will be the first to put it into service to the major world markets we serve. Pan Am’s fleet of thirty-three 747s will be the largest. * * * Pan Am’s operating and marketing plans for the 747 program have already been formulated. Ground facilities are also being prepared. The men and women of Pan Am at home and abroad will be ready to put the plane in service”. Development of the Boeing 747 as described above, was not without other challenges affecting performance and costs – the addition of a spiral staircase, for example. Building the massive aircraft also required a larger assembly plant. That was achieved by construction of a new plant at Everett, Washington, near Paine Field. In addition, Pan Am built a maintenance facility and extended the Pan American terminal to accommodate the big jetliners. The illustrations below were taken from Pan American’s 1968 annual report. The first 747 was delivered on time and was christened by the First Lady Pat Nixon on 15 January 1970. Six days later, on 21 January, the first commercial flight of a wide-body jet, Pan American flight 2, was scheduled for departure at 1900 hours for London. Clipper Young America was assigned the duty. Unfortunately, an overheating engine delayed the departure and also required a substitute aircraft, Clipper Constitution. Never-the-less, at 0152 hours on 22 January, the 747 departed New York and arrived later that morning in London, completing an historic flight, opening the door to new era of commercial airline operations and making the Boeing 747 one of the most recognizable aircraft in the world. In preparing this article, the following sources were used: John Marshall’s article in Airways Magazine, “The Big Jumbo”; The Chosen Instrument by Marylin Bender and Selig Altschul; An American Saga – Juan Trippe and His Pan Am Empire, by Robert Daley; Pan Am – An Airline and Its Aircraft, by Ron Davies; and Skygods – The Fall of Pan Am, by Robert Gandt; and Pan American’s 1967 and 1968 annual reports. On interesting side-note: Pan Am’s order for twenty-five 747s and an option for ten more in 1966 was the biggest ever at the time. In November 2013 Emirates airline rewrote all records in civil aviation with an order for 150 Boeing 777X, comprising 35 Boeing 777-8Xs and 115 Boeing 777-9Xs, plus 50 purchase rights; and an additional 50 Airbus A380 aircraft.